Nashville: Popular Southern Gospel artist Matt Felts has released a new project, Angels On The Battlefield, featuring original Civil War hymns. The historic album features songs familiar to the soldiers of both the North and South, each played on period instruments by Nashville best musicians. The album also includes gripping narrations that honor the role faith played during America's greatest conflict. Felts was joined in the studio on select songs by an all-star cast including Johnny Minick, Mike Allen and Aaron Minick. "This project has been years in the making. I wanted this to be as accurate to what you would have heard if you joined soldiers around a campfire." Felts stated. Angels On The Battlefield comes out as the Civil War community celebrates the 150th anniversary of the conflict. The project is scheduled to be carried by all National Parks across America as well as museums and historical gift shops. It will also be sold by major retailers both in the Christian market as well as secular business's such as Best Buy and Borders. "From the beginning, my goal has been to present God's love to people that may never come to a Gospel concert or church service. I am overwhelmed the response that we have already received. God is opening huge doors." added Felts. The project was debuted in Gettysburg in March of this year. "I have heard many Civil War projects and this album is by far the best I have ever heard. It is a must have for any Civil War enthusiast or fan of great music." Said George Lomas, Civil War expert. Leslie Taylor announces her departure as soprano singer for The Taylors. home church while pursuing a solo ministry. When you think of Gospel Music, LeFevre is a name that has always been at the top of our field. In 1921, two brothers and a sister formed a group, which became known as The LeFevre's, traveling and singing the gospel for decades. In 2005, a new sound emerged in Gospel Music, holding the same banner that was held by the original LeFevre group. Just one year after forming The LeFevre Quartet, fans voted them 2006 Horizon Group of the Year. In 2009 their song "Big Mighty God" was nominated as a top 5 song by the Dove awards. This group continues to hold up the standard that was started over 90 years ago. Here at Activate, we are excited about our new partnership with The LeFevre Quartet joining with them to reach the world with the Gospel in song..
Left to right: Brandon Barry (Lefevre Qt. ), Harold Reed (LeFevre Qt. ), Rick Sandidge (Actiate Records), Tre’ Corley (Activate Records), Mike LeFevre ( LeFevre Qt. ), Jordan LeFevre (LeFevre Qt. ), Paul Corley (Activate Records). Nashville, TN - After weeks of waiting, fans finally get the chance to see the official music video release of Legacy Five’s “Ask Me Why.” It is based on the true story of a woman named Patty and her daughter Hannah who converted to Christianity from Islam after accidentally showing up at a Legacy Five concert. The video is already gaining buzz on YouTube with exponential growth in hits, comments, and shares on Facebook. L5 celebrates the release along with cover stories in both Singing News Magazine and SGN Scoops this month. Patty Davenport Bahhur is actually featured in the video as a woman going through hardship and finding grace. Scott Fowler, lead singer, tells the story of how Patty stumbled upon the Celebration Event at the Grand Ole Opry with her daughter and looked to the group for answers. When she was given the wrong tickets to an event she thought would be the Opry show, she noticed something strikingly different about the concert. The people looked happy. The video takes place at the Franklin Historic Presbyterian Church featuring a congregation comprised of L5 fans who volunteered to be extras. “Ask Me Why” was penned by Kenna Turner West, who made an appearance at the filming along with Jim Brady of The Booth Brothers and Les Butler of Singing News. Band members Scott Fowler, Scott Howard, Glenn Dustin, Gus Gaches, and Trey Ivies are featured at several locations throughout Franklin and Nashville, TN. Watch the video here: http://www.youtube.com/watch?v=uhEkZeCTwCU. For more information about Legacy Five, visit www.legacyfive.com. Godsey and Associates, visit www.godseyandassociates.com. 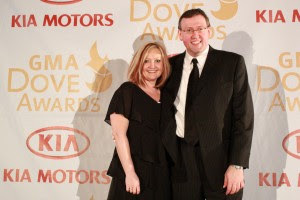 Publisher, Rob Patz and Editor in Chief, Rhonda Frye of SGNScoops Magazine covered the 43rd Annual Dove Awards at the Fox Theatre in Atlanta, Georgia. “The pre-show and the awards show was amazing and I couldn’t be more pleased with the way our industry was represented,” says Rob Patz. “I thought it was awesome to see different genres come together with the same message lifting of the name of Christ,” Rhonda adds. Nashville, TN -Hall of Fame vocalist and five-time Grammy winner Larnelle Harris was the special guest artist for the 2012 Easter Celebration Dinner and Concert for the ambassadors and diplomats of the United Nations. This event was held in the Roosevelt Hotel Grand Ballroom in New York City. Over 200 ambassadors and diplomats from the 193 member nations, representing several major faith groups, attended the event sponsored by The Foreign Service Fellowship International organization. In addition to his five Grammy and eleven Dove Awards, including being named Male Vocalist of the Year three times by the Gospel Music industry, Harris has garnered nineteen #1 national radio singles and countless top 10 hits. He was the first gospel artist to perform inside the Kremlin after the fall of the Soviet Union. He is one of a handful of celebrities to receive the Ad Council's Silver Bell Award for Distinguished Public Service in recognition of his song "Mighty Spirit" as the theme song for the longest-running Public Service Announcement in television history. Hendersonville, TN (April 12, 2012) – Daywind Records artists celebrated a great night at the 2012 Absolutely Gospel Music Awards, held at the River of Life Church in Smyrna, TN. Karen Peck & New River were awarded Favorite Mixed Group, as well the overall Fan Favorite Artist of the Year. Their #1 song, “On The Banks Of The Promised Land,” from the 2011 project, Reach Out, received Song of the Year, as well as Progressive Song of the Year, while Karen Peck Gooch was awarded the Susan Unthank Memorial Award. Libbi Perry Stuffle received the award for Female Vocalist of the Year, and the Perrys’ Dove Award nominated song, “Celebrate Me Home,” won for Traditional Southern Song. The Booth Brothers were named as the Best Live Performer and their latest album, Let It Be Known, took home the award for Progressive Album. Sisters were awarded Female Group of the Year and the new duo, Wilburn & Wilburn, were recognized as Breakthrough Artist of the Year. Daywind writer, Kenna West, was awarded Professional Songwriter of the Year. The award show, hosted by Karen Peck Gooch and Sonya Isaacs Yeary, featured live performances from several of the nominated groups, including Daywind artists Karen Peck, Wilburn & Wilburn, and Sisters. The members of The Isaacs are the guests on the current edition of Gospel Music Today. The Feature Group is The Faith Harmony Boys, and Ken and Jean Grady host southern news and concert updates. Ken and Jean visit The Owasso Gospel Opry, in Owasso, OK, to hear Chosen Quartet sing. Jean reviews a new CD by Omega, and the show features singing by Tribute Quartet and a vintage video by The Florida Boys. The latest edition of Gospel Music Today is online now at the Gospel Music Today website, www.gospelmusictoday.com. The Southern Gospel Music Association’s (SGMA) announced April 5 the 2012 inductees to the SGMA Hall of Fame. and in the deceased category, Charlie Burke, Stuart Hamblen, Geraldine Morrison and Ace Richman. "It will be a great honor to recognize the careers and contributions of our newest inductees this fall at Dollywood," said Charlie Waller, SGMA executive director . is Oct. 3, 2012 at Dollywood in Pigeon Forge, Tenn. These inductees or their families join the Oak Ridge Boys - Duane Allen, William Golden, Joe Bonsall and Richard Sterban who will be honored with the James D. Vaughan Impact Award. Tickets for the event are on sale now available from the SGMA office by calling (865) 908-4040. We are excited to present a PACKED April Edition of Scoops Magazine! Thanks to Lorraine Walker for a fabulous cover story featuring, Legacy Five. We have stories on your favorite artists to include: Doug Anderson, Declaration Trio, Dailey & Vincent, Harold Reed, Jordan Wilburn, Gene McDonald and Morgan Easter. Rob Estep gives us a “behind the scenes” look with promoter, Rhonda Thompson and Lou Wills Hildreth tells us about the very first Dove Awards! Jennifer Campbell shares a very special conversation with living legend, Bill Gaither as he tells the story behind “Because He Lives!” Angela tells us what songs are topping the charts and Jonathan Edwards talks with Rich Crist of the Crist Family. Sandi Duncan Clark reviews brand new music and Rhonda Frye reviews a concert featuring The Greesons, McKameys, Michael Combs and the Singing Cookes.Scott Rhoades and Jennifer Campbell share their thoughts regarding Easter, John Mathis Jr encourages with words of wisdom and Laurette reminds us of the benefits of exercise. We were saddened at the news of the death of southern gospel promoter and friend to many, Jim Arneson. Rob Patz and several friends share the thoughts of Jim. We appreciate you reading our magazine and sharing the link with your friends, family and friends! FARMINGTON — Local Christian artist Chelley Odle performed live at a Saturday night concert celebrating the release of her new CD, “Incredible Love.” The concert, being held at Farmington’s Centene Center, with opening act, Nashville singer / songwriter Michael Boggs. Odle, of Desloge, last year signed with Activate Records to work on “Incredible Love,” her sophomore recording project. She worked on the album with Grammy Award-winning, Dove-nominated producer, Tre' Corley. Odle has opened for such acts as The Crabb Family, Crabb Revival, Austin's Bridge and Gold City. She has also performed with Crossway, Annie McRae, Aaron and Amanda Crabb, Crabb Revival and Jason Crabb. She was a 2009 and 2010 ICM top 10 nominee for female vocalist of the year. Odle was also the 2010 CCMNOW Christian Country Honor Award recipient of the Female Vocalist of the Year Award. In 2011, she was nominated once again for the ICM Female Vocalist of the Year Award. Opening act, Michael Boggs, joined the contemporary Christian group, FFH, in 1999 while a sophomore in college. FFH was extremely successful with seven No. 1 radio singles and seven GMA Dove Awards nominations. He recorded five FFH projects with Essential Records that have sold nearly two million copies. As a band member Boggs was involved in numerous special event projects, such as the multi-platinum WOW Hits and WOW Worship. When FFH took some time off the road in the fall of 2006, he stepped into the role of worship leader for a ministry in Brentwood, Tenn., that hosts nearly 1,000 college students and other young adults every week. Boggs continues to keep a rigorous solo-touring schedule and has lent his songwriting skills to other artists who have garnered him 10 singles, as well as a featured song in the motion picture, “Facing the Giants.” He wrote three of the songs on Odle’s new CD. Nashville, TN Award-winning female vocalist, CARRIE HASSLER will kick off her new album, THE DISTANCE at a CD Release Block Party on Saturday, April 28, 2012 in downtown Pikeville, TN at 4:00 pm. The event will include performances by DALE ANN BRADLEY, STEVE GULLEY, Harlan, Kentucky based national touring act and fellow Rural Rhythm Records label-mate, CUMBERLAND RIVER, and many more special guests. This free event will take place in downtown Pikeville adjacent to Carrie’s family owned restaurant, LITTLE MAGGIE’S. NASHVILLE, TENN. (April 5, 2012) - Canton Junction, the brand-new quartet consisting of Matthew Hagee, Aaron Crabb, Michael Sykes and Tim Duncan, recently returned from an amazing trip to Israel. The group performed at the Jordon River, in Jerusalem, and prior to a speech from Prime Minister Benjamin Netanyahu. Canton Junction records for Difference Media Group based in San Antonio, TX .Difference Media Group, led by Vice President and producer Michael Sykes, was formed by Matthew Hagee to reach the world through the powerful message of gospel music. Connect with Difference Media on Facebook at http://www.facebook.com/DifferenceMediaGroup. bring the best of Southern Gospel music to Lincolnton, GA.
Perrys and the Primitive Quartet. Long Show and The Lewis Tradition. In addition to an added day attendees will get a peak at a piece of history. devoted fans who want to honor the family in this manner." The event is hosted by Jeff & Sheri Easter who will appear all three days. Things CD - written by Wil Nance, Sherrie Austin and Steve Williams. Awards and three Cash Box Awards. LOS ANGELES, The week leading up to Easter Sunday has always been a special season at Trinity Broadcasting Network, the world's largest religious broadcaster and America's most-watched faith channel. And for good reason: during holy week Christians around the world commemorate the Lord Jesus Christ's suffering for us, His sacrificial death for us, and the glory of His resurrection, where death was conquered and eternal life through Christ Jesus is assured! To celebrate, TBN has selected movies and programs that will comfort, inspire, and challenge viewers throughout this sacred season. For the second year during Easter week, TBN is featuring what has become a cinema classic for believers all over the world: The Passion of the Christ. Produced by Mel Gibson and starring one of Hollywood's most beloved actors, Jim Caviezel, The Passion follows the Savior through the final hours before his death, from his agonizing intercession in the Garden of Gethsemane and savage scourging at the hands of the Romans, to the final moments of his brutal crucifixion. Throughout this intense and emotion-packed film, Jesus is portrayed in all of his humanity while flashbacks of his life reveal his true divine nature. Due to the overwhelming response to last year's showings, TBN will air The Passion of the Christ throughout the week leading up to Easter Sunday, beginning April 4. Visit TBN's Passion of the Christ web page (here) for specific broadcast times. TBN will also feature a special four-day showing of the film April 4th through the 7th at Church of All Nations on the grounds of Holy Land Experience, the Orlando, Florida destination that brings the rich history and glorious heritage of biblical Israel to life for the entire family. For more information on this free live showing of The Passion of the Christ, call 1-800-447-7235. Jim Caviezel, who has been a guest speaker at Holy Land Experience, said his decision to portray Jesus in The Passion was deeply influenced by his love of Scripture. "Throughout my professional life, I have always been drawn to truth when selecting projects," said Caviezel, who also provides the voice of Jesus on The Word of Promise, a popular audio Bible produced by Thomas Nelson. "In the Scripture I find truth that has long been a source of strength and constant inspiration." In addition to The Passion of the Christ, TBN has a full line-up of special programming for the entire family during Easter week, including the mysterious and dramatic film The Road to Emmaus; the moving documentary Twelve Ordinary Men; the unforgettable Apostle Peter and the Last Supper; the stirring In Remembrance; and the classic Easter film The Robe. 'We've been so blessed over the years to be able to air unforgettable and moving films, concerts, and programs reminding us of the awesome gift of salvation through Christ Jesus and His love and sacrifice for all of humanity," said TBN founder Dr. Paul Crouch. "Easter Week is truly a special season for us here at TBN. Our prayer is always that our programming will present the life-changing power of Christ’s love for our viewers all over the world." The Perkins are inviting you to their 2nd annual One Dandy Night fundraiser at Jim Dandy's Family BBQ! This special night includes a complete meal from Jim Dandy's famous BBQ, & a concert with The Perkins all for just $20! Invite your friends & family, & come out to help support The Perkins ministry. All proceeds go towards helping The Perkins ministries move forward in reaching the lost & encouraging hearts all over the country! One Dandy Night will take place on Sunday April 29th, with dinner beginning at 6pm & concert at 7pm. Call 513-476-0909 for more details, or email Aaron@theperkinsonline.org. age of 30, which adds youthful enthusiasm to their sound. singer Troy says, “My favorite female vocalist in Southern Gospel is Libbi Perry Stuffle. future lies for these talented young men is in the hands of God. from The Apostolic Boys in the next ten years! void that cannot be filled. to enjoy his retirement in full. Newburgh, IN - CGMA award-winning artist, David East, known for his work with the Southern Gospel Times, is pleased to announce his first national radio release, "Morning After The Rapture". The song shipped to radio on March 28, 2012 on the Patterson Promotions Volume 8 compilation. As the title implies, "Morning After The Rapture" describes events that will take place on the morning after the rapture occurs. The song's poignant lyrics strike at the listeners' hearts, and it has become the most requested song wherever David ministers. David's performance of "Morning After The Rapture" at the CGMA International Convention in October, 2011 earned him the "International Songwriter of the Year" award. "I am so excited to see the message of this song carried to the airwaves," said David. "The response to this song has been incredible, and I pray that God uses this song to reach even more people. I encourage everyone to call their local station and request Morning After the Rapture." Ken Patterson of Patterson Promotions said, " Patterson Promotions is proud to release this timely single for David; he has a great vocal sound. For 2000 years we've heard the message, "Jesus is coming back" - Lord forbid that we get callused to the fact that he really is coming soon. If you thinks it's dreary now, just wait till the light is gone!" Phil Culbertson, Pastor of Christ Corner Church in Henderson, KY shares, "David East puts words to music that not only inspire but cause you to sit back and take inventory of your life with his song, Morning After the Rapture. This song brings more than a melody - it's a message reminding you that this world is temporary and God's grace and mercy is the only hope in a world that one day will come to an end. This song is truly one of a kind, written to the depths that touches the soul with a message so simple even a child could understand it." Jerry Adams, Church of God District Overseer and Pastor of the Shelburn Church of God in Shelburn, Indiana adds, "The first time I heard that song I knew it was destined to be counted among Southern Gospel's greatest songs. It speaks to where we live today and I know it will reach many people for God." "Morning After The Rapture" is featured on David's first solo project, "He Kept His Promise", available at http://www.davideast.net and on ITunes.